The best applicator for applying a ceramic coating to your vehicle! Ceramic coatings are the best choice for the longest lasting protection, but they can be frustrating to apply without the right tools for the job. Having the proper applicator sponge makes all the difference in the world, which is why we spent countless hours developing the McKee’s 37 Coating Applicator. This specially designed, closed-cell applicator features a high-tech European foam that eliminates streaking and high spots, delivering a smooth application for your favorite ceramic coating. Are you thinking about applying a paint, wheel, or glass coating to your vehicle? 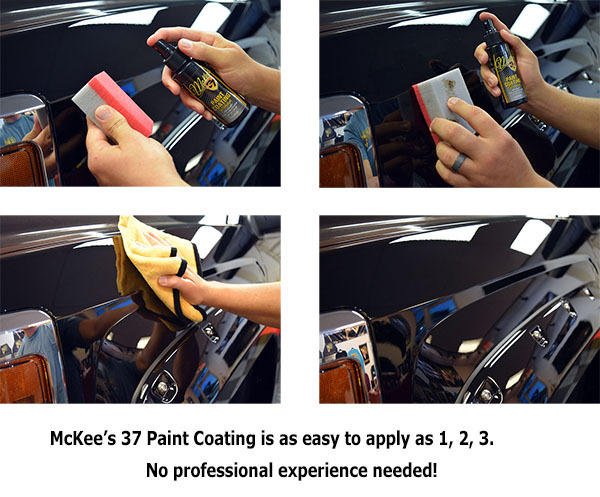 Reduce the chance of mistakes by using the McKee’s 37 Coating Applicator to apply your coating of choice! Our Coating Applicator is easy to hold onto, even when your hands are sweaty from a long day of detailing! The soft, closed-cell European foam is attached to a coarse grey foam that won’t accidentally slip out of your hand. If you’ve read this far, chances are pretty good that you’ve been seriously considering applying a ceramic coating (hopefully ours!) to your vehicle. Don’t take a chance using that old, tatty applicator pad that’s been hanging out in the back of your tool chest for the last couple years. Equip yourself with the McKee’s 37 Coating Applicator to guarantee smooth, effortless application of your ceramic coating!